Below are eight reasons why the ability to reflect will be good for your recovery. If you never reflect on the things that happen to you, it will be hard for you to learn anything from these events. It could mean that you keep making the same mistakes repeatedly – this is what commonly happens with those caught up in addiction. Your experiences will often contain valuable nuggets of information that could greatly improve your life, but it requires reflection in order to capture these insights. This is similar to how professional football teams will have an after match debrief as a way to learn from the things each player did well or badly during the game. One of the things that is almost certain to happen to you while trying to achieve your goals is that you will face failure. Some people just give up when things start to go wrong, but the most successful people in life are those who know how to deal with failure. These people did not get to where they are by never falling down; it is their ability to keep on getting up that gives them their advantage. Part of this is learning from what happened – for this to occur, it is necessary to reflect on the situation. Dealing with failure is part of the process of success, so learning to reflect is a vital skill. One of the fantastic things about reflection is that it can often trigger great ideas that you would have otherwise missed. These can be the type of ideas that change lives or lead to amazing new discoveries. All the great writers and artists devote some time to reflection because they understand that this is going to help them generate new creative thoughts. Your experiences are likely full of gems, but you will only find them if you bother to look. One of the most dangerous things that can happen to you in recovery is that you begin to experience a lack of purpose. This can easily happen if you just become caught up in the demands of day-to-day living. Life can just become monotonous and you begin to feel as a hamster endlessly running around on a wheel. Reflection gives you the opportunity to see the bigger picture so you can make sense of what you are doing and why you are doing it. It is important that you do this type of reflection regularly so that you do not lose yourself – it is similar to creating and regularly redefining your mission statement on life. Individuals who regularly reflect on their life are likely to feel more fulfilled and generally happy. This is because of the perspective they get on things as well as the fact that they have greater insight into their own life. The act of reflection is also satisfying once you get into the habit of doing it. One of the problems many have in sobriety, especially in early recovery, is finding meaningful goals. This is because the years of addiction may mean that they have lost sight of who they are and what they want out of life. Goals give structure to sobriety, meaning that you can achieve things that increase your comfort and level of happiness. The problem is that if you have goals that you do not care enough about then you are less likely to achieve them, which can negatively affect your self-esteem and ability to achieve other goals in the future. 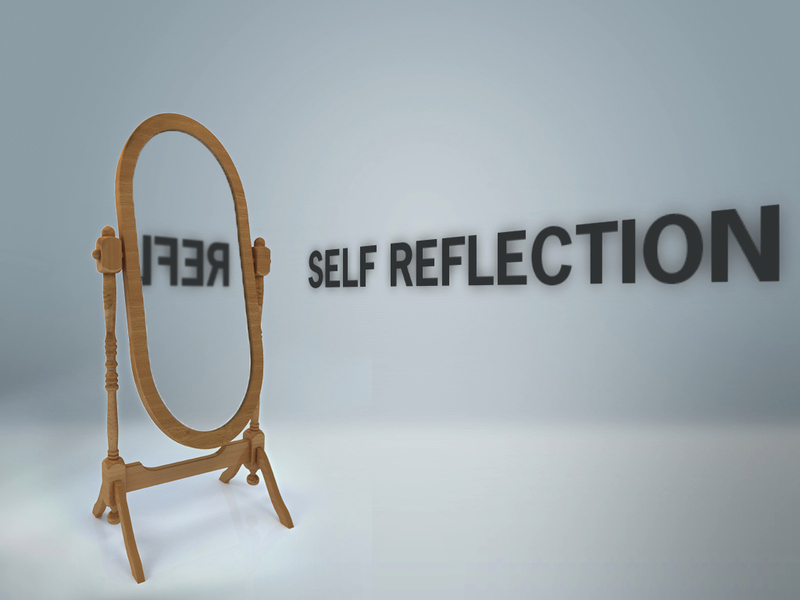 Reflection will allow you to develop a much better understanding of what it is you want out of life. This then makes it much easier for you to generate goals that you feel happy about and that you are therefore far more likely to achieve. All spiritual paths involve some type of contemplation and reflection. Socrates, back in ancient Greece, made the famous pronouncement ‘an unexamined life is not worth living’. Becoming more spiritual is all about developing a new sense of ease with yourself; for this to happen you need to do plenty of reflection. Most of the development that occurs after you give up alcohol or drugs will be due to you chipping away at your character flaws. It is not that you are a bad person; all people have many character flaws, but the motive for doing this work is that by removing your flaws life becomes better. For example, if you have a tendency to lose your temper, it will mean you alienate people and are likely lose friends. By learning how to better manage your anger, you are likely to behave better in the future. You are going to be aware of some of your more obvious character flaws, but there are also plenty that are so subtle that the only way to uncover them is by reflecting. The easiest way to reflect effectively is to keep a daily journal in which you write down your experiences and try to see if there are any lessons to be learnt. Some people find that going for long walks is a great way to reflect on things – it is usually best to do this as well as some reflective writing or otherwise the insights you gain while walking can easily be lost. If you are going to reflect while walking then it is a good idea to take along some type of recording device. Most smart phones now have apps that you can download which can allow you to record your voice – the other benefit of this is that you don’t have to feel embarrassed talking into a recorder in public because it just looks like you are talking on the phone. One of the important things you need to do in order to reflect effectively is read back on experiences after some time has passed – sometimes it takes a bit of time before your experiences make full sense. A great way to do your reflection is to start an online blog, and this means that other people can learn from your inner-work as well. The great thing about a blog is that it also acts as motivation to keep on journaling because it becomes a commitment.